A chalkboard might seem like a simple object, but when used in a wedding or reception, it can be a fabulous accent or decor piece. There are so many ways to incorporate a chalkboard into the ceremony or reception from offering directions to guests finding their way around the venue, to highlighting the reception menu. 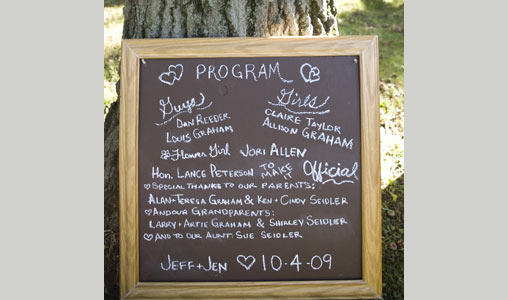 Use a chalkboard as a program guide or sign for guests they work perfectly for any style wedding. For an outdoor feel, a rustic or simple frame is perfect to display the chalkboard, or, a beautiful, ornate frame looks stunning at a more formal wedding. A large chalkboard, complete with wedding party information and illustrations creates an amazing backdrop for the bride and groom to take timeless photos Â– and, your guests will enjoy taking photos with the chalkboard to remember the day! Miniature chalkboards can be used to display food buffets, menus, seating arrangements or dessert Â– use them any way you like to show off your personality. Get creative and use it to personalize your special day!